I am so grateful and appreciative of this wonderful honor! It was such a thrill to receive this prestigious award and to be appreciated & recognized for my work in the health and fitness industry. 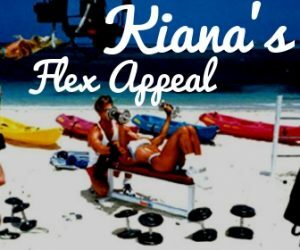 I have led 1000’s of televised workouts on Kiana’s Flex Appeal (ESPN), BodyShaping (ESPN), Kiana’s Summer Sizzle (ESPN), Extreme Energy (ESPN), X Games, Kiana’s Too Fit 2 Quit (ESPN), Super Bowl Special, Disney’s Wide World of Sports, ABC, CBS. that adds up to over 3.5 million repetitions in my career! Whew! The Trophy is gorgeous! I will treasure it! Here’s the scoop! We jumped on an early flight, leaving home at 4:30 am Yawn! Grabbed a blueberry protein shake for the road. Had my hair styled the night before – a little trick I learned on television. If you get it in tight waves the night before and have a super early flight, it will be loose and beachy by the time you get there. We flew to Ohio where Arnold has his annual Sports and Fitness Expo. We flew 1st class and the only reason I mention that is I truly believe that we shot ourselves in the foot. Now it’s going to be a chore to get our kids to go back to coach. We did some seated exercises and stretches in the seats. When I was filming Kiana’s Flex Appeal, I did a series of “in flight” workouts for a major airlines where passengers could follow along to seated exercises 🙂 Hm. I should bring those back!